Purpose: Develop and strengthen the trapezius muscles. 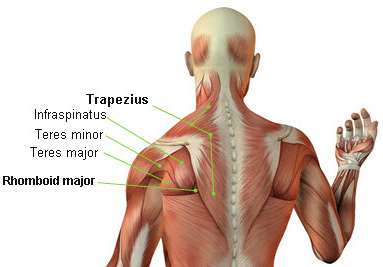 The trapezius muscle is the large diamond or triangular shaped muscle that starts from the neck, extends laterally in between the shoulder blades, and continues on down until it meets the lower back (spinal erectors). Target Muscle Group(s): The primary muscle group being targeted is the upper portion, middle portion, and lower portion of the trapezius, as well as the rhomboid (small muscle that sits deep in the trapezius muscle). 1. Grab a dumbbell on each hand and stand erect. 2. Feet should be comfortable at hip width apart. 4. Using your trapezius muscles shrug both dumbbells straight up towards your ears (you won't be able to touch your ears but try to). 5. Pause at the top of the movement and squeeze your traps hard for one second. 6. Lower the weights straight down to the starting position. 1. During the shrugging motion breathe out. Breathe in while lowering the weights to the original starting position. 2. This next point is very important, as many people get this wrong. 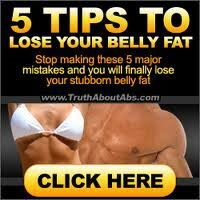 When performing this exercise go straight up and down. Do NOT rotate your shoulders in a semi-cirlce forwards or backwards, this could lead to injuries (see Safety Precautions section below for more detail on this). 3. You could use straps to reinforce your grip if performing very heavy shrugs. Shoulder Shrug Variations: Use a barbell instead of dumbbells (aka Barbell Shoulder Shrugs); use a low pulley cable (Cable Shoulder Shrugs); use a Smith Machine (Smith Machine Shrugs); or use the Hammer Strength Shrug Machine. 1. Do NOT whatsoever use momentum or try to jerk the weight up, this could lead to serious neck and back injuries. If you can't lift the weight without cheating, use lighter weights. 2. Do NOT rotate your shoulders forwards or backwards as this could cause injuries to your shoulder joint, specifically the glenohumeral joint and rotator cuff. Neck injuries could result as well.